A major tourist attraction in Shivpuri is the Sakhya Sagar Lake which borders the forests of the Madhav National Park. The vast expanse of water is surely a treat to watch and its calm and tranquil surroundings have a very soothing effect on the mind. In the year 1918 the Sakhya Sagar Lake in Shivpuri was created on the Manier River. The Sakhya Sagar Lake helps in maintaining the ecological balance of the Madhav National Park. A large number of reptiles, marsh crocodiles, Indian Pythons and Monitor Lizards are to be found in the Sakhya Sagar Lake. The lake looks stunningly beautiful at dusk when it reflects the changing colors of the sky. There is a boat club on the shores of the lake. The boat club is a very delicate structure and has glass panels. 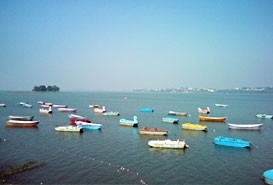 The boat club is connected to the Sakhya Sagar Lake by a broad pier. If you stand on the deck you are sure to be overwhelmed by the beauty of the scene in front of your eyes. The vast stretch of water and beyond it the Vindhyachal hills with their dense forest cover looks absolutely stunning. Shivpuri is well connected by bus to the important towns and cities of Madhya Pradesh. Gwalior which is close to Shivpuri is well linked by airways and railways to various parts of the country. Shivpuri has its own railway station but very limited number of trains stops here. 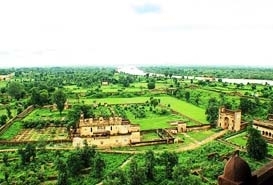 So it is best to come to Gwalior or any other Major Town of Madhya Pradesh and then avail a bus us to reach Shivpuri.